Have I mentioned that butter has its very own place in my food pyramid? My Primary Care Physician, and the folks at LabCorp, can attest to this fact based on my cholesterol numbers. All the steel cut oats in the world can not counteract the effects of my particular love of butter. I don’t care what the creepy Quaker Oats guy says, I have the lab results to prove it. After my recent string of kitchen fails, I was desperate for an easy win. And what is easier than taking a pint of cream and turning it into butter? Sure, if you were going for whipped cream and got butter instead you might be a touch frustrated. But there’s a reason that people say things are “like buttah”. Because butter rocks in its awesomeness. It is creamy perfection in a stick. It is gloriously simple. And it makes just about everything taste better. What’s not to love? The hardest part about this experiment was finding heavy cream that was pasteurized but not ultra pasteurized. The ultra pasteurized variety will not result in butter. It took some searching but I finally stumbled across some at My Organic Market in Jessup, although I’m told that Atwater’s at Belvedere Square carries local heavy cream. If you’re like me and trying this just for kicks, it might not be worth going out of your way to get the pasteurized cream. But if you happen to come across some in your regular travels, put a pint in your basket. When you tell someone that you made butter, they’ll think you spent hours sitting at a churn and be very impressed. In reality, you ran your mixer for about five minutes. That part will be our little secret. While my doctor would be horrified to hear me say that I have a recipe for butter, she shouldn’t be alarmed that it’s going to increase my consumption. Because as easy as this is to make, my tastebuds are so accustomed to Land o’Lakes that my homemade version seemed heavy and flat. So as fun as this experiment was, I think I’ll stick to getting my butter at the store where it comes in proper sticks. 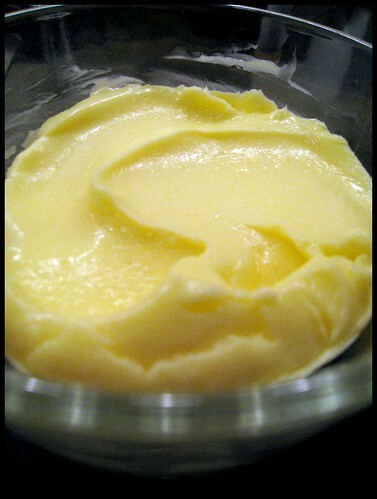 BAH Note: Like everything else, there are numerous recipes for homemade butter on the Interwebs. And they all tell you something just a little bit different…add in some plain yogurt, let the cream come to room temperature, chill everything before you start, blah blah blah. I don’t have the time or patience for all that nonsense. Back before butter came from the grocery store, I doubt there was raging debate about these things. So I kicked it minimal old school…except for that part about the mixer. If you’ve got yourself an actual butter churn, or think you have the stamina to shake this up in a Mason jar, more power to you. 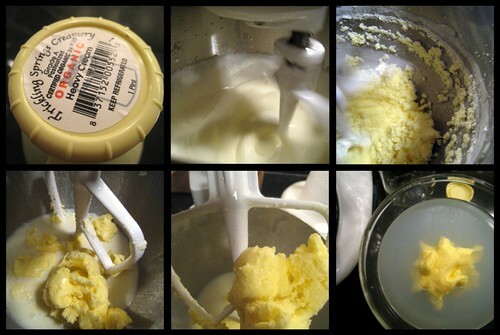 Put cream in the bowl of a standing mixer fitted with the paddle attachment. Mix on medium. After a few minutes you will start to get whipped cream. Place a kitchen towel over your mixer now to avoid splatter. Continue to mix on medium. The mixture will start to look curdled but keep mixing. After a minute or two the butter will start to separate from the buttermilk. Once the butter has clumped around the paddle and completely separated from the liquid, stop the mixer, remove the butter, and place it in a medium bowl of cold water. The water will turn cloudy from the remaining buttermilk. Remove the butter from the cloudy water and place it in a second bowl of cold water. Squeeze the butter with your hands to work out any remaining buttermilk. Repeat as necessary until the water stays clean. Remove the butter from the water and pat dry with paper towels to remove any water. At this point, you can add a pinch of salt and work it into the butter with the back of a spoon. Taste for seasoning and add more salt as desired. Cover tightly and refrigerate. Strain the liquid from your mixing bowl through a lined sieve, or cone style coffee filter, and reserve for use in baking. And what’s the first thing you’re gonna spread that buttah on? I should have saved myself a step and rubbed it into my thighs straight away. But we choose cheesy drop biscuits as the delivery system. Trickling Springs is also available at Whole Foods in Harbor East. And speaking of Whole Foods, they really do have the best butter–365 Unsalted. At $2.59 a pound you can’t beat it–and I like it much better than L’OL. Beth, I would have never imagined that Whole Foods has such a reasonable price for butter. Once I get through the stash in my freezer (I freeze butter when I get it on sale) I may have to give the 365 brand a try. Should I also confess that I only use salted butter? Nah, admitting that I freeze it is enough of a confession for one day. I’ve lived my entire life bowing down to butter. No reason to stop now. you really should give it a try. It’s really good. I find that Whole Foods actually has remarkably good prices on quite a few things. Like yesterday, I ran to Giant during lunch to get cinnamon. And since I wanted “real” cinnamon, not the impostor stuff, I paid WAY more than I ever would have paid at WF! Girl, it’s not the doctor I’m worried about. I’m more concerned about losing my street cred with y’all. This reminds me of the time long ago ( my grandparents had a dairy farm at one time) when we kids decided we were going to make our own butter. This is long before we ever had a food processor. We took RAW MILK straight from the cow, and added it to the blender, turned it on and watched the fun. It seemed to take forever, like watching paint dry, but eventually the container was filled with thick, chunky wonderful goodness. Now when my grandmother next wanted to use the blender and found the motor completely burned out and seized up…….that was another story. I still don’t know how she found out it was us. One of my cousins ratted i’ll bet! Sometimes I am my own worst critic. You are absolutely right Beth. Thanks. I just wanted to let you know that MOM’s has officially changed our name to “MOM’s Organic Market” instead of “My Organic Market”. You can still call us “MOM’s” for short. Have a great day! P.S. The butter looks AWESOME! Oh dear. My Organic Market did indeed change their name to MOM’s Organic Market. I still call that other store Fresh Fields…I wonder how long it will take me to remember to just say MOM’s? By the way, if you ever pop into MOM’s, see if they have any of the local chicken thighs. Hands down, it’s the best chicken I’ve ever had.